Summary: SO many of us want to be more organized and more productive. We all have goals we want to accomplish, but we also need to take care of ourselves mentally and emotionally. We want to do more, but we want to stress less. Bullet journalling has become wildly popular in the last few years, because it offers both of those things: it's a system for planning and organization, but it's also a way to journal and reflect. Bullet journals can range from extremely simple and minimalist, to ornately decorated and complex, and the beauty of the system is that it's completely customizable for your life. 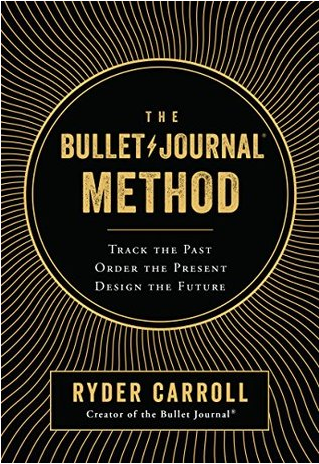 You can pretty much learn everything you need to about bullet journalling from the internet these days, so Ryder Carroll, creator of the system, offers a little something extra in this book, along with instructions on the basics, so that no matter where you are in your bullet journal journey, there's something you can get out of this book. Thoughts: I picked this up because I am a bullet journaller (journalist?). I first got into planners, period, about two or three years ago because yes, I was interested in organizing my life, and at the time, my local Michaels store had just started carrying Happy Planners. The combination of planning, decorating, and memory keeping really appealed to me (and plus, I love playing with stickers). Getting into Happy Planners launched me into the rabbit hole of "Plan with me" Youtube videos, and about six months into my 18-month planner, I discovered bullet journalling and it really appealed to me. This is going to sound extremely frivolous and childish, but I have always loved the idea of being one of THOSE PEOPLE whom you see in coffee shops, scribbling some poetry or observations or sketches into an expensive notebook. I imagined those people as having some rich inner life that I desperately craved, and I could buy all the Moleskines I wanted, but it wasn't going to give me inspiration for WHAT to put into those notebooks. So now I had some ideas--I loved the fact that I could set up my planner any way I wanted, I could decorate it any way I wanted, and it was an A5 size notebook that would fit into nearly any bag I wanted, and I could finally BE that person scribbling into a notebook in a coffee shop. (I know, I'm ridiculous.) I learned everything I could, starting with the basic video on the Bullet Journal website (linked above), I learned brush letter, and god help me, it even got me learning how to sketch and doodle. It got me discovering my artistic side, in addition to helping me stay organized. It got me journalling (like, long-form journalling) again, and it gave me a place to write down quotes and reflections. And even though I don't faithfully plan in a notebook (sometimes I switch back to Happy Planners because they're pretty and their design team is obviously better at art than I am), I still stick to the same system. But anyway, you're not here for my bullet journal story. 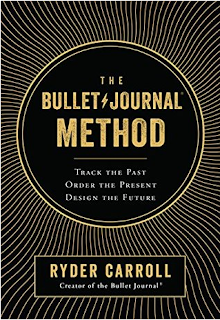 I'm laying this all out for you so that you know that I'm not a newbie to the system, and I picked up this book because I wanted to know what more Carroll had to say about bullet journalling. I appreciated this book because I didn't feel like it was patronizing or overly idealistic. I subscribe to the Bullet Journal Youtube channel, and was relieved to find that it was Carroll's voice coming through the book, which meant that it would be straightforward, not chirpy, and not too "bootstrappy" (which is to say, "EVERYTHING WILL BE FINE IF YOU JUST THINK POSITIVE AND TRY HARD ENOUGH!" I hate books like that.) I mean, there's definitely encouragement to follow your dreams and stuff, because why else would you want to organize your life and set goals if not to improve your life, but it's positive without sounding unrealistic. I do think this book is worth it if you're ready to take a deep dive into goal setting (with Bullet Journalling as your system), but if you're not so interested in that yet, and you just want to know more about the system and try it out just for planning out your daily life? You'd be fine with just poking around on the Bullet Journal website and Youtube channel. Don't get me wrong, I think a BuJo newbie could get a lot out of this book, but I think it helps to be already interested/enthusiastic. I'm not sure if a person who randomly sees this at a bookstore would get the same experience that I did. That said, it's an easy, quick read, and has some pretty good gems to help you with organizing your life. I highly recommend the method, but as far as the book itself, I think your mileage may vary.